it also inculcates the qualities of empathy, better understanding of values & morals and the ability to communicate better. We believe, children’s theatre is no child’s play. 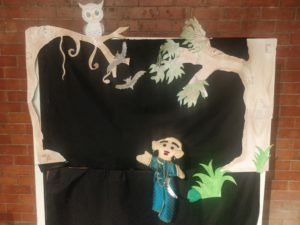 Using a combination of Puppetry and Live actors, this childrens’ play speaks about peaceful co-existence of all beings, in the backdrop of a Vikram-Betaal story. fight for a mysterious apple that appears out of nowhere. Each claims that the apple belongs to them. A strange being that looks like an alien stumbles into this situation and is made the judge as each of them present their case for owning the apple. The strange being makes a judgement that leaves them open-mouthed and red-faced. question whether the earth and its resources belong to us. It encourages children to think about the virtue of giving versus a mindset of entitlement. 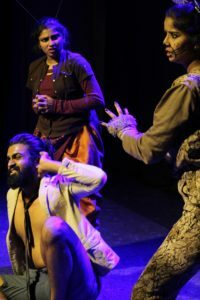 Want to know when the next show is happening? Want us to come to your school/organisation/apartment to perform for your kids? YouAndMe Theatre  collaborates and organizes the annual day for your school, end-to-end. We train the kids in Drama, Dance, Music, and Puppetry, and bring them all together under one single mega production. After discussions with the school, we come up with a concept, script it to suit the number of kids performing, compose and record our own music and train the kids for the performance. 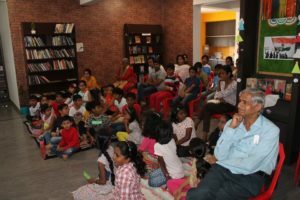 Every presentation of ours has had/will have, a life lesson (moral, ethical and empirical) that the children will take away in accordance with the best traditions of a kids’ show.